Step into an interactive bubble world and be dazzled by jaw-dropping masterpieces of bubble artistry. There’s not much (or any) story to the Gazillion Bubble Show—everything you need to know is right there in the title. World renowned “bubble artist” Fan Yang and wife Ana have traveled the globe perfecting what they affectionately call “bubble artistry,” meaning you and yours are in for a filmy, floating, family-friendly spectacle. Lights, lasers, music and a variety of tools come together to create a theater’s worth of the show’s namesake object, including square bubbles, bubbles within bubbles, “dancing” bubbles and a host of equally exotic soapy orbs of all sizes (including some big enough to fit a human). The spectacle climaxes with a deluge of popable air globules that number, if not in the gazillions, then at least somewhere close. What is Gazillion Bubble Show Like? Designed as an air light slip of a production, Gazillion Bubble Show is essentially a kid-friendly variety show built on a single subject. Creators Fan or Ana act as the show’s artist of the day, taking the stage to showcase one bubble-themed trick after the next. A slim 85 minutes with no intermission, the foamy piece moves on the energy of its mostly young audience, bursting into its finale right around the same time ticketholders attention spans start to wander. Is Gazillion Bubble Show Good for Kids? Gazillion Bubble Show isn’t just good for kids—it’s made specifically for them. 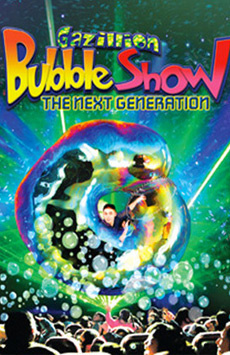 The production’s bubble stunts will appeal to the tactile senses of all showgoers, while parents can rest easy knowing everything remains decidedly rated G. A note of warning: the show does utilize audience participation, so adults toting introverted or nervous tots should go for tickets closer to the back of the theater to ensure a more passive theatergoing experience.